Almagre is a Spanish name for “red earth”. The City of Colorado Springs web site states that before Pikes Peak was named Pikes Peak, it was called Almagre by the Spanish settlers. Almagre Mountain is the second-highest peak seen from Colorado Springs, to the left/south of Pikes Peak. For today’s hike we drove up Old Stage Road, to Gold Camp Road, and up Forest Road 376 (90 minute drive from Colorado Springs). The hiking route approaches Almagre from the West. 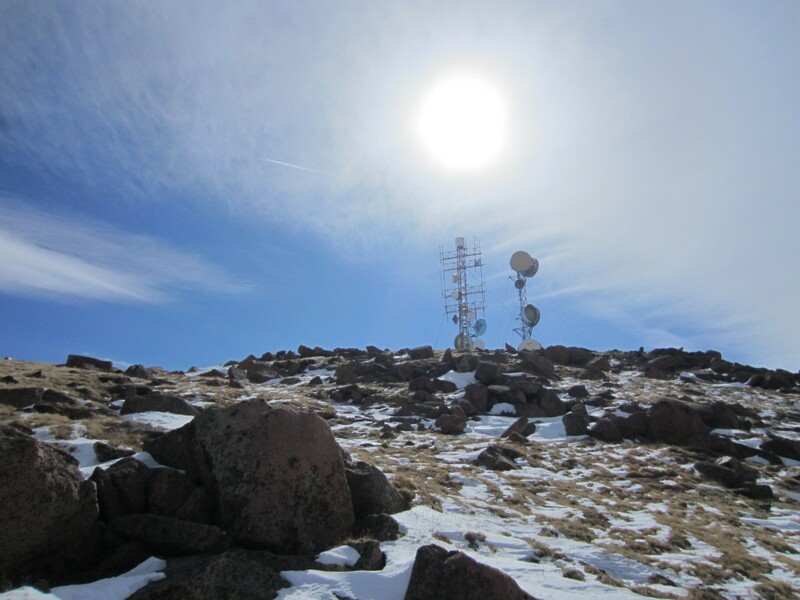 We made it to the summit of Almagre South (12,349′), also known as Mount Baldy, where an antenna farm is located. Total elevation gain from our parking spot was only about 1,550′, but the snow made this a challenge. The trail was snow-covered, so I had to use map skills and snowshoes to make my way. 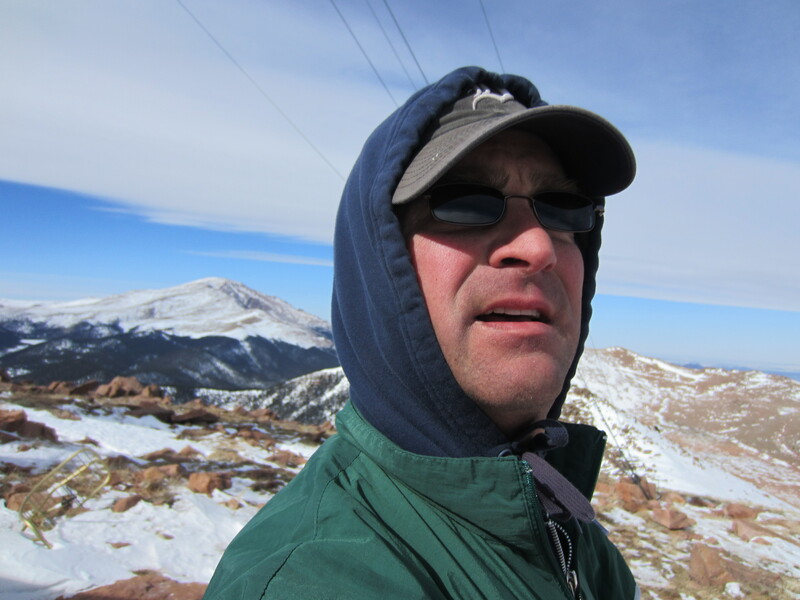 I struggled mightily hiking through deep snow in snowshoes with no trekking poles, falling a bunch of times. It was really rewarding to make the summit! I did not think that we had enough time before sundown to make it over to explore the north/primary summit. – Hiking in snowshoes without trekking poles is possible, but challenging to the point of frustration. Get some poles, man! – When hiking a big mountain, an early start is almost always better. – When going off trail, refer to the topo map often to avoid unnecessary detours. Spring conditions existed on the trail in Waldo Canyon today. The trail alternated from dry, to muddy, snowy, slushy, and wet. At least there was no ice. Michelle ended up with wet feet, and Sammy needed a bath when we got home. Waldo is a popular trail, and today was no exception. I estimate there were about 30 cars in the parking lot, and we encountered at least 50 people on the trail. Today we hiked a loop starting in Red Rock Canyon, through part of Section 16, and back to Red Rock. The Section 16 trails are not well-documented on my maps, so it was interesting to explore a little bit.